The Moon is in Aquarius all day (until Wednesday, March 18th, at 6:58 AM). 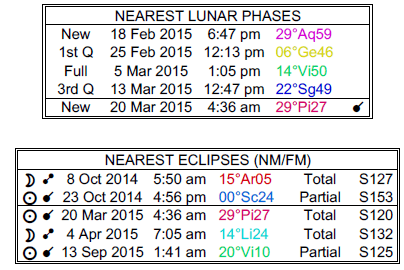 The Moon is void from 2:18 PM forward (until tomorrow at 6:58 AM). The Moon is in its Waning Crescent phase from 12:49 AM forward. Venus enters Taurus today (Venus will transit Taurus from March 17-April 11). A Solar Eclipse will occur on March 20th in the last degree of Pisces. This is not an ideal time for major new beginnings and decisions. Venus leaves your sign and enters Taurus this morning, dear Aries. While it’s usually quite nice to have Venus visiting your sign, its next step has its distinct benefits as well. From now and until April 11th, you may be acquiring desired things, whether these are special gifts or items you’ve been wanting for some time, or giving yourself extra attention and pampering. It’s a good time for business, generally speaking, for finding lost objects, for shopping, and for beautifying your body or environment. Today, you very easily get a little lost in your inner world or in fantasy. It may be an especially imaginative and perhaps creative day, with a tendency to talk or reminisce about the past, but you might also feel a little restless or discouraged if “real life” seems a bit dull in comparison to your inner landscape! A memory or a chance meeting with someone can arouse all sorts of memories and feelings, and possibly some constructive ideas. Venus enters your sign today, dear Taurus, and will visit Taurus for more than three weeks, until April 11th. This yearly happening is a good one for personal appeal. You’re more noticeable and your most attractive traits are in the spotlight. It’s a good time to attract attention and even admiration, although it might also be a time when you tend to keep your distance emotionally, even though you are especially charming and you’re quick to smile and spread your warmth. This may in fact increase your desirability. Today can be a rather dreamy one, although discouragement may be part of the picture as well. Resolve to enjoy the moment rather than to expect too much. You may be dreaming up interesting and inspiring plans for your future now. While conversations with friends and lovers can be fun and imaginative on one hand, there is a small tendency for misunderstandings. You may be called upon to help out a friend today. Venus moves into your privacy and soul sector today, dear Gemini, where she will be a guest until April 11th. This points to a period for processing your feelings, taking care of loose ends when it comes to your relationships, and discovering more meaning to, or getting to a better understanding of, your past and recent events. This is not a time when you’re inclined to announce your feelings or flaunt a new relationship. You’re in need of extra time and space to make sense of your feelings. You may be drawn to private moments and experiences with friends and lovers. Today, you can be both reasonable and intuitive at once, and you might come to interesting conclusions about long-term goals or major life plans. Be vigilant when it comes to what you share with others, particularly professionally and publicly. Otherwise, enjoy the increased imagination and creativity that’s with you today, and express your ideas with extra flair. Today, Venus moves into a position that subtly enhances your natural style, likability, and powers of attraction. Venus will continue to work her magic through to April 11th, so take advantage. Friends, or friendly people, are drawn to you. It’s important, and possibly quite natural, to give others space and freedom. It’s a good time to attend parties, get-togethers, and group meetings. It’s a good cycle in which to mend broken fences. Forgiveness comes more easily. Today, with Mercury and Neptune moving to an alignment, there could be a strong desire to act on a fantasy. There can be some inclination to gloss over or adjust previously held beliefs and morals. Venus enters your career and reputation sector this afternoon, where she will stay until April 5th. It’s a generally strong period for public relations and likability with authority figures. You are more concerned about the image you project during this cycle. People may notice you for your artistry or way with people. Your fantasy world is rich today, but be careful that your imagination doesn’t run away with itself. There is highly creative energy available today, but it’s also potentially very confusing and unrealistic. You will need to try to discern between illumination and self-deception. You can have tremendous insight into others’ motives and desires, even if they are doing their best to keep these things to themselves. This is definitely a day for freeform fun rather than structured, detailed work. Venus moves into a position of harmony with your sign today, dear Virgo, and this serves to enhance and highlight your more attractive qualities. Until April 11th, this cycle stimulates a more adventurous, direct, spontaneous, and outgoing to your love life. As well, your tastes may be a little more exotic or unusual now. You value growth and you might aim to rid yourself of stale or stagnant elements in your relationships. Today, you could come to a pleasant agreement with someone. Before putting your faith entirely into what seems like a new beginning, however, give it some time and consider all angles. Venus begins its transit of your intimacy sector today, Libra, and under this influence that lasts until April 11th, you’ll be taking your relationships, interactions, and connections a little more seriously than usual. You may be less direct in your pursuit of affection now. It’s a good cycle for gaining support, both emotional and financial. You can approach typically taboo or tricky topics with grace now. Today, you can be especially sensitive to, and aware of, small changes around you. Adding unusual or creative elements to your routines can help you to feel more fulfilled now. The same is true of work – you might benefit from creative or freeform activities. You might also find yourself in the position to assist or support others today. 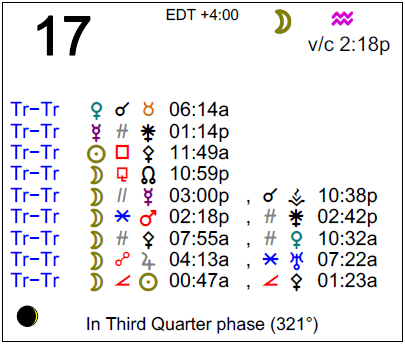 Venus begins transiting the sign directly opposite yours (Taurus), dear Scorpio, where it will stay until April 11th. This is a generally friendly position for this easygoing, pleasant planet as it promotes harmony in one on one interactions and partnerships. You are more conciliatory, and you tend to attract helpful or caring people into your experience. particularly partners and potential partners. Today, there can be a lot of thought or discussion about creative projects, hobbies, or romantic relationships. If you resolve to “go with the flow” and avoid putting too many expectations on others or life itself, then it can be an inspired time. Trends are strong for discovering or rediscovering romance, but with this extra sensitivity present, you may be a little moody if things are not turning out as hoped. Let your mind wander and enjoy the excitement of possibilities now. 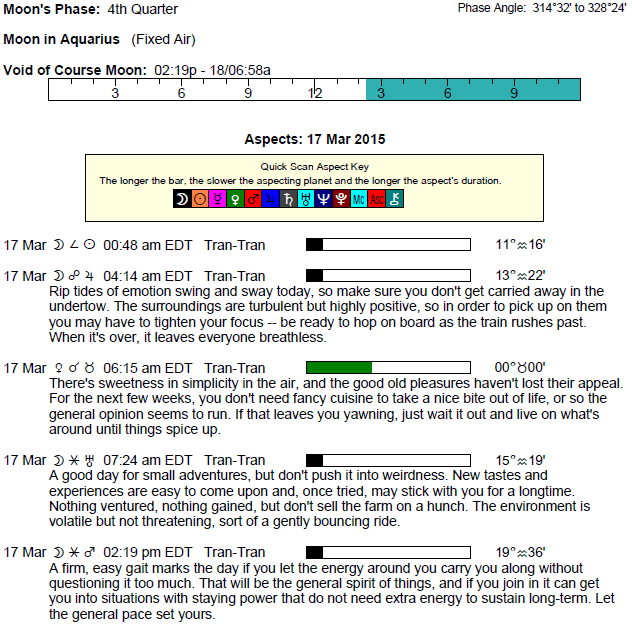 Venus begins moving through your work and health sector today, dear Sagittarius, and this can connect pleasure with work in some way during the course of this transit (until April 11th). You could be bringing more warmth, artistry, and harmony to your work or daily routines, for example, or social opportunities can arise through the work you do. It’s a good time for work that involves teamwork or smooth relations and diplomacy. A personal touch can help improve your work or services. Today, you might be seeking out more idyllic and pleasing conditions around the home or with family. You might enjoy thinking or talking about the past and especially pleasant memories. Try to be content with leaving things as open to interpretation. If you keep your sense of humor and avoid looking for clear answers, it can be a creative and imaginative day. Venus begins its transit of your solar fifth house today, Capricorn, and is now in harmony with your sign, until April 11th. It’s a good time to circulate, enjoy yourself, meet people, and share your warmth and confidence. It’s quite natural for your talents and strengths to shine through. You’re a little more liberal with your affections and quick to smile. It’s a good time for redecorating, entertaining, and the like, although not the best for making progress with practical matters. Today, even though you should watch for self-deceit and impatience, it can be a good, creative day for communicating and learning. It may not be the best day for attention to detail, but it can be strong for taking an unusual approach to absorbing and sharing information. Venus begins its transit of your sector of home and family, dear Aquarius, and during this cycle that lasts until April 11th, you’re most attracted to familiar places, situations, and people. It’s a good period for taking special care of the home and family, particularly as you make efforts to smooth over differences and to create a warm, friendly, and harmonious home environment. It’s a less visible period overall, but also important in the cycle of things in terms of building your confidence and sense of security. Today, with Mercury and Neptune approaching a conjunction, it’s easy to convince yourself of something you’d like to believe. This might revolve around your personal possessions, money situation, or business. Ideas for business or making money can be unique and creative. You might also have a way with the resources you already have that brings them to a “like new” state. Venus moves into harmony with your sign today, dear Pisces, where it will stay until April 11th. This transit subtly enhances your communication skills and might help you to attract desirable projects and experiences your way. You are more diplomatic and tend to use words and wit to attract who and what you want into your life. Today, you are more talkative than usual, and people are drawn to you. A significant person in your life can be in agreement with you, or in some way in your corner with your needs and wants in mind. You are picking up a lot from what’s going on around you, and people may be spreading good word about you. If Your Birthday is March 17th, If Today is Your Birthday full horoscope here. Patience with money and people. We are sensuous, tolerant, and comfortable with others, but possibly possessive. We value longevity. You become stuck on certain ideas and find it difficult to change your mind. You have difficulty communicating your thoughts to others. Sun 00° Taurus 03' 42"
Moon 12° Scorpio 55' 44"
Mercury 04° Aries 03' 27"
Venus 29° Pisces 42' 38"
Mars 13° Gemini 17' 11"